Question: several folks have done artichokes for ~1h at 185F per Keller's general vegetable advice. I have two good-looking, fully grown globe artichokes. How do you prep them for cooking? What do you add to the bag? I've only done the baby ones I'm growing right now but I only peel off the outer leaves until the tender ones, trim the top and nip off some of the stem. The thing I love is not having to completely clean them down before cooking, I cook for 45 minutes at 185 in some butter and salt then shock, clean them up and am all set to go. I've posted this picture before but, because of the similar size of my carrots I can cook both at the same temp and time for perfect results. Looks like to me in the book that the large chokes are fully cleaned, hallowed out with only a little leaf left on and stems are taken off. Do you still acidulate them? When I do the little peeling of leaves and trimming in the beginning yes, but once vacuumed and in the water bath they don't oxidize. Can anyone tell me the time needed to bring a 2" steak from fridge temp to 53c? Doug Baldwin's site must be down and I can't access his tables for tonight's dinner. Thanks! Hi. I'm looking to get into Sous Vide cooking. Is the 'Polyscience Sous Vide Professional' one of the best products for it? I found it listed on Williams-Sonoma for $800; is this the cheapest price? And can anyone recommend a good vacuum sealer? The cheapest way to get one would be to get one that was used at a lab. They will cost alot less, but you will need to clean it very very well before use. A vacuum-sealer is convienient (a clamp-type machine will do, it should have an instant-seal-button), but ziploc-bags are fine to start with; see the video linked in Douglas Baldwin's Practical Guide (a must-have, print it as a booklet!!) how to get most of the air out of a ziploc-bag. An immersion circulator is nice to have, but not a must-have. If you prefer a streamlined machine, the SousVideSupreme is ok. If you prefer the lowest price and greatest flexibility, a PID-controller (SousVideMagic or Auber) combined with a rice cooker, crockpot, slow-cooker, stockpot or FreshMealsMagic will do. To start and get experience, see My article "give sous vide a try...". My first year of sous vide cooking was with the oven/water-pot-method, but as soon as you want to go into LTLT (long-time/low-temp) cooking to gelatinize collagen, i.e. tenderize tough meat, you will need a PID-controlled water-bath. How much is convenience worth to you? I'm a year or so into my voyage into SV cooking and have been doing rather decent and occasionally amazing stuff with a SVM 1500D PID controlling a HUGE slow cooker with a inexpensive fish tank bubbler helping to circulate the water. Overall not a huge investment. All in, roughly $250-275 as I remember. HOWEVER, if I were doing it all over (anyone wanna buy my kit? ), I would very likely save up for an all-in-one device like the SVSupreme @ $450 or so. Dealing with all the bits and pieces of my set-up is a minor, but to me significant, issue. I think I would do more SV preps more often -- but probably no better -- than my current set up with an all-in one. One of the real fun things about SV is experimenting. Having an all-in-one can really facilitate the experience, I'm jealously guessing. Has anyone systematically compared the SVSupreme and the Polyscience for folks who go that route? Is that an appropriate discussion for this thread? BTW Ziploc has launched a line of SV plastic bags that includes a vacuum-extractor. Works wonderfully . . . as does DB's cheaper, and only slightly more demanding, approach. I'm afraid our applied math department server died over a week ago and I don't know when they'll be back up. I've now permanently moved my sous vide guide to http://www.douglasbaldwin.com/sous-vide.html. [i hate having to pay for server space, but I just don't trust my department's servers anymore and too many people count on my guide.] Please use this address in your future posts (and update your links up-thread if you're able). On Saturday I had a couple racks of baby backs I've been cooking that were outstanding. I started with two racks of baby backs, each cut in half. I took the silver skin off and then rubbed them with what probably many people would consider a strong amount of liquid smoke (you could see a color change in the meat). I then put a simple dry rub on them, threw them in the bags and threw them in at 135 degrees. 72 hours later I took them out and threw them on the grill for a few minutes on each side with a sauce. I couldn't even get pictures because of how fast they went. It wasn't just fall off the bone tender, but fall off the meat tender. They also had a good amount of medium-rare pink look to them as well. I flipped a set over to cut them (so I could see the bone) with a sharp knife, and in that process the meat separated from itself and left a chunk on the plate. If you weren't overly cautious you ended up eating a good portion of your ribs off the plate with your fingers because it fell off. The flavor was good. I didn't do anything fancy with the rub or sauce so plan to work on that a bit, but unlike others I've heard I didn't find the meat bland on the inside. Though next time I think for the last 24 hours I might take them out of the bags, rub them with some sauce, then reseal them for the last 24 hours to see if the sauce flavor can penetrate a little more. Skirt steak or hanger steak? Diaphragm anyway. When I have done hanger steak it, I have cooked it 24 to 36 hours at 132F and it was super tender. It was very good but I didn't find it nearly as flavorful as skirt steak nor did it have the same lovely mouthfeel as the skirt steak. The hanger steak that I had would have been too tender if cooked longer. But I suspect there is a lot of variation in the quality of the steaks out there. I would check it at 24 hours and judge how much longer it needs. Thanks! I do not know if it is skirt or hanger, the butcher said it is from the diaphragm and in German it is "Rinds-Leistenfleisch", it looks well marbled, the cubes are 15-25mm thick, I marinated and spiced it, the main portion will be 55°C/24h and a small portion will be just seared for comparison. The price was 2/3 the price of brisket. If it is a skirt steak, you are in for a real treat. So far, everyone who has had my sous-vide skirt steak has said that it is the best beef they have had. Skirt steak I would cook for no longer than 24 hours. It comes out as tender as a high-quality filet and even more flavorful than a rib-eye. With a really nice luxurious mouth-feel. Sadly, in the U.S. skirt steak is no longer cheap like brisket. 15 years ago, it was a very cheap cut. The two mouthfuls seared without sous vide were tasteful, but rather chewy and dark red inside, after a few seconds more in the skillet it was more pink, chewyness and taste unchanged. The main portion was SV 55°C/24h, dabbed dry and seared in smoking hot rice bran oil. It came out with a nice crust and pink inside, definitely less chewy than without SV (but not perfectly fork-tender), and very tasteful. This was my first experience at all with beef diaphragm, it was pleasing, but not the ultimate "treat" as e-monster predicted. One reason may be that we have grass-fed beef in Switzerland and never ever the quality of beef you have in the USA. Another reason may be it was pre-cut in cubes and from a supermarket's self-service shelf, not the real "butcher's steak". I will definitely try to get skirt steak from the butcher who dry-ages his beef, and maybe I should increase SV-time to 36h. I got an answer from customer service of the supermarket chain where I bought these diaphragm cubes: it was hanger and skirt mixed fifty-fifty. Even with the double antenna hack, range deteriorated and finally connection failed completely. The batteries had gone below 1.4V within a few weeks! Doh! Obviously the Maverick ET-73 is a battery guzzler, so it is better to switch it off when not in use. With new batteries, it now works again like a charm, with 16.5cm antenna extension on both transmitter and receiver, the 66cm full-wave extension is no longer necessary. Range measured outdoors without any obstacles is about 25m. Sous vide rigs may fail, so there should be an alarm when temperature deviates from the set-point. Lately it happened to me that the FreshMealsMagic triggered the GFCI (ground fault circuit intterrupter) and bath temperature dropped from 49°C to about 48°C during 2h20' cooking. This did not cause me any problem, but if it happens during a 48h-cooking without being noticed, you have to discard your food. It may also happen that a sensor fails or shifts and bath temperature rises or drops. As my SV-rig resides downstairs in the air-raid-shelter, I looked for a way to baby-sit my SV-rig without going downstairs every hour, and when ordering Nathan's book at Amazon, I also ordered a two-channel remote smoker thermometer Maverick ET-73 which arrived yesterday. It has a channel for the food temperature with a high-alarm and a channel for the oven temperature with high- and low-alarm; the latter can be used to sound an alarm whenever the bath temperature goes outside your set limits. A known issue with the ET-73 is poor range, especially through walls. I had to place the receiver on the kitchen floor as near to the transmitter as possible to get a signal. So I hacked the receiver and did the Maverick ET-73 Range Modification From LilSmoker with a small modification shown in the pictures below, soldering the antenna wire to the rear side instead of the front side of the small PCB with the horseshoe shaped circuit board antenna, so the antenna wire does not have to be bent to exit the case. Now the range is sufficient to place the receiver anywhere in the kitchen and have a good signal. It's far from the 100 feet that Maverick claims, but an air-raid-shelter is a bit of a Faraday cage, so I am satisfied with the result. It is possible to make a similar modification on the transmitter, see http://www.instructables.com/id/Increasing-the-Range-of-a-Wireless-BBQ-Thermometer/, but in my case this was not necessary. Range was a bit better, but after extending the antenna on the transmitter from 16.5cm (quarter-wave) to 66cm (full-wave, on recommendation of Robert Jueneman), it was even better, now connection seems to be stable across a ceiling of reinforced concrete. Although the ET-73 has some drawbacks, it is a (the only?) way to baby-sit a SV-rig and sounding an alarm, should the temperature deviate too much. 75-77°C / 12h: falling-off-the-bone tender like traditional braise, difficult to unbag without falling in parts. 58.5°C / 12h: fork-tender, but not falling apart like a braise, rather like a steak, pink inside. 58.5°C / 26h: fork-tender and succulent with a nice pink interior. For my taste best time-temp. so far. Multiple incisions in the circumferential fascia avoided the cuts to become cupped by the shrinking fascia. When cooking eggs SV I have always used the same size of egg. I use the eggs I get from my friends for other applications because they are from different types of chickens and different sizes. Would it be true that because it never exceeds a certain temperature that all the eggs would cook the same at 147 for 50 minutes? 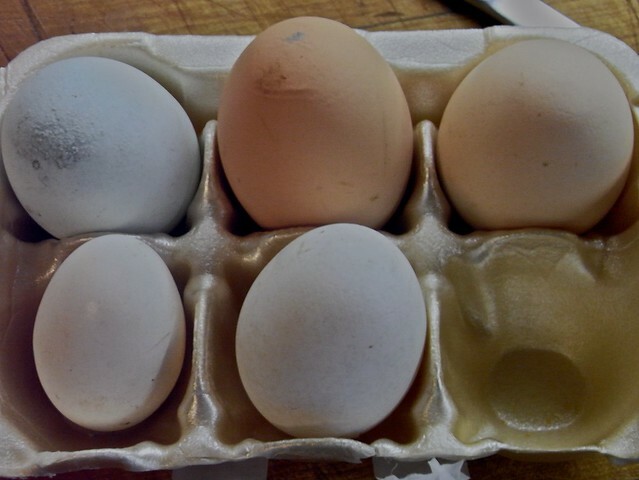 I have found that in this temperature range there can be differences between how much watery white there is in eggs that are from different purveyors or that have different ages. Yolks seem pretty consistent in this time/temp range -- but if one is trying to totally nail that point where the yolk just barely starts to gel I think you need the same types of eggs that are the same age. There seem to be subtle differences based on the eggs' age and also the diet of the chickens. It isn't so critical unless you are trying to get the yolk in this particular state -- where it looks like a softboiled yolk but when you cut into it, it is like a tender curd. Anyway, that has been my experience. I purchase from a premium supplier but even then the eggs seem to vary across seasons. Seems there's a lot of variance to be accounted for. As an aside, looking at Rene Redzepi's new Noma cookbook he uses sous vide to poach eggs and features them on a number of his dishes. He cooks them for 20 minutes at 58C but always uses only the yolk, discarding the white. If you've been on the fence not sure if you can decide if you should jump in to the waterbath or not, the folks at SVS are trying hard to push you in. That's less than I paid for the unit by itself. Seems like a pretty good deal as I believe that the original price was not ridiculous. SVS in USA: 450 USD, in Europe: 599 EUR (that's 1009 USD!) -> ??? My calculation of 599 EUR at today's exchange rate of 1.38329 USD per Euro equals about 828.596 USD. Maybe you can get one sooner at this cost! I just took my food dehydrator out after a lengthy storage, and thought it might be a good tool for doing something like sous vide, without the bags. Has anyone tried? I tested mine, and it held its temp within 2 degrees F, which is good enough for about 75% of what I sous vide. I'm thinking it would be especially good for anything using a dry rub, like barbecue ribs. Air is not a very good heat conductor. So, it takes a lot longer to get foods to temperature in the air than it does in a water bath -- and there are no tables that I know of that would give you an idea of how long it would take to get your food to temperature. I think that there is serious risk of food being in the danger zone too long if using air as the conductor. Buy a propane torch, but use MAPP gas. MAPP is similar to propane but it burns hotter, and has less of an issue with flavor transfer. I prefer "self-lighting" or "trigger start" propane torches. They are about $50 - available at Amazon, or Home Depot. Even better, in my view, are torches that give you a hose between the tank and the torch - they are much less tiring to hold. here is an example. The non-self lighting torches are cheaper - less than $20. I picked up a MAPP torch from Home Depot but haven't figured out how to achieve appealing browning on my SV proteins with it. The flame is so hot it burns surface irregularities before browning the overall surface. I've only used it 2-3 times so far, so I need to experiment a bit more with how far to hold it away from the food, how quickly to move it, etc. Perhaps drying the protein surface and/or coating with a light glucose solution would help. I'm also thinking about getting a flame spreader attachment. Does anyone have advice on technique using MAPP torches? I'm also now wondering if the extra heat of the MAPP gas vs. propane is useful in culinary applications. If you have to hold the flame farther away or move it faster across the protein then it seems the extra heat is not really being taken advantage of. nathanm said something similar ("A propane torch is already hot enough that there is no increased utility in MAPP.") a few years back, but seems to prefer MAPP now. Perhaps there are some other advantages to MAPP? What type of proteins are you cooking? In my opinion, torches are mostly useful for beef. They aren't so useful on poultry or pork (except perhaps very fatty cuts like ribs). Using sugar will make matters worse. The reducing-sugar wash trick is for browning in pans to allow the browning to happen at a lower temperature than usually required. I have never used MAPP gas, it is hard for me to imagine that there is much advantage in this context to using it over Propane or Butane. Personally, I think the Iwatani Butane torch is the way to go. It is inexpensive, powerful and has a very adjustable flame and the refill cartridges are cheap. I used to use Bernzomatic propane torch before switching to the Iwatani. There is some practice required. I find that it is important to keep the torch moving back and forth over an area and far enough away from the meat that it doesn't burn the meat instantly. I start with the flame far away and move in and find the distance where if I move the torch back and forth I have control over how browned the meat gets. The temperature inside a dehydrator is not very uniform, in addition, the thermostat is most likely a bi-metal type and is highly inaccurate (+- 10 degrees or more). In any case, it is to dehydrate, so you may be making jerkies if you cook meat long enough inside. Moving air is a very good thermal conductor, I think.